Of course, I would prefer to title this post “Orders Rolling In,” but I need to put accuracy first. Today I received one more order through PayPal. I never heard back from the gentleman who placed the first order, despite my e-mailing him twice. So I have now refunded his payment through PayPal. I may be hearing an indignant cry of, “Why did you refund that money, and where’s my book?” I’ll await further developments on that order. Meanwhile, Clenise and I are cranking out books at a better rate than before. She has just about mastered the art of binding with our hot-melt glue machine. She bound four new books tonight, and we trimmed four others from last night. Soon we’ll have an inventory of about eight books. I need to send two of them off to the Library of Congress to register the copyright, and I’ll keep the others on hand in case I can get Amazon, Barnes and Noble, and Borders to take some for their online operations. I doubt I can get any into stores, so I probably won’t make that effort, at least for now. The shrink-wrapped books are starting to look pretty good. Here’s a photo I just took (with the D-Lux 4 camera, of course), showing a stack of books after shrink-wrapping and another stack waiting to be shrink-wrapped. 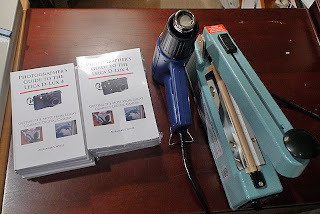 The heat gun and sealer are shown also. There’s still a lot to do. I need to work on copyright registration, getting books handled by Amazon, etc., and contact various camera-oriented web sites about promotion. That’s just a start. But the project is working out better than I imagined as of now, because I think we have managed to solve the toughest technical problems — mainly printing the books in full color and on both sides of the paper, printing the covers, and binding the books. This entry was posted in Uncategorized on October 29, 2009 by Alex White.